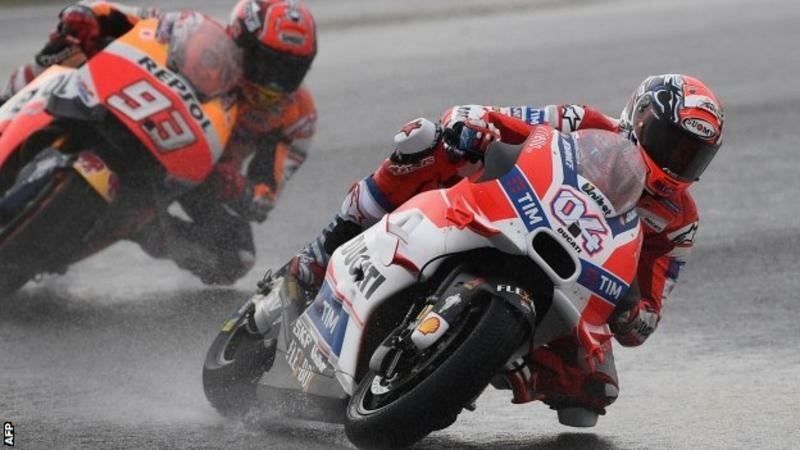 Ducati rider Andrea Dovizioso took victory in the Malaysian Grand Prix to become the ninth different race winner in MotoGP this season. Dovizioso, 30, started from pole after the race in Sepang had been delayed by rain, but dropped to third early on. He overhauled fellow Italian Valentino Rossi for the lead with five laps left after Rossi ran wide and pushed home his advantage. It was only his second MotoGP victory in 159 races. "It's really nice to come to this moment," said Dovizioso. "In these conditions I struggled a lot in the race and had some problems, but I really wanted it." Rossi finished second ahead of Spaniard Jorge Lorenzo to secure runners-up spot in the championship, while Spanish world champion Marc Marquez, who had been hampered by illness over the past few days, crashed out of fourth place during the race and eventually finished 11th.